Check engine light faults relating to the Mass Air Flow Sensor are becoming less common, but do occur. The tricky thing with some of these types of faults is that you can have a mass air flow sensor concern without triggering the check engine light. Before we get into diagnosis let's start with a brief overview of the sensor itself. The main purpose of the Mass Air Flow (MAF) Sensor is to measure the volume and density of air entering the engine at any given time. The computer uses this information in conjunction with input from other sensors, to calculate the correct amount of fuel to deliver to the engine. Input from this sensor is also used indirectly to help calculate desired ignition timing and transmission operating strategies. MAF sensors are mainly designed as a "hot wire" sensor or a "hot film" sensor. Both sensors function in a similiar fashion. Hot wire sensors pass current across a platinum wire and hot film sensors pass current across a foil grid. The current level is regulated to maintain the hot wire, or film, at a predetermined temperature. This temp is either a direct value, or a value that is a set number of degrees above ambient (outside) air temperature. So how does this tell us how much air is getting into the engine? Well, as air passes across the mass air flow sensor, it cools the hot wire, increasing the amount of current needed to keep that wire at the specified temperature. The amount that the wire is cooled is directly proportional to the temperature, density and humidity of the air passing through the sensor and as such, the current increase needed to heat the wire allows the computer to easily calculate the volume of air entering the engine. Mass air flow sensors typically either send a voltage, or frequency signal to the powertrain control module (PCM). Hot wire sensors typically have an operating range of 0 - 5 volts, with idle voltage being around .5 - .8 volts and full throttle application is normally between 4 and 5 volts. Hot film sensors typically produce a frequency out put of 30 - 50 Hz with 30 Hz being idle and 150 Hz at full throttle. There are some other subtle differences between the sensors but these do not affect function or purpose. So what types of symptoms can we get from MAF sensors, and how should we test for these faults? Well as we stated earlier, MAF sensors can produce driveability symptoms without generating a check engine light code, so some specific checks are in order. For ease of diagnosis a scan tool should be used to monitor sensor readings. In some instances it's okay to take sensor value readings by back probing the appropriate terminals at the MAF sensor. If specific MAF check engine light codes are present, then proceed with the appropriated tests. If no codes are present, or if you have lean codes you suspect are caused by a faulty mass air flow sensor, perform the following. Obtain sensor specifications from a reliable source; you can send us an e-mail from the Help Link and we can assist with most information. Hook up a scan tool with the ability to monitor sensor valves (PIDS) and pull up the mass air flow sensor. Record your MAF sensor reading at idle, and again at various RPM ranges. Compare the values against specifications. Next, start from idle and increase throttle opening while watching MAF reading. Increase should be steadily proportional to RPM change. Perform the same checks while lightly tapping on the sensor, or heating the sensor with a blow dryer. Any fluctuation, or out of specification reading indicates a mass air flow sensor, or related wiring concern. Repair and retest. I would also recommend monitoring MAF values while driving the vehicle and checking readings while the concern is present. Have an assistant drive while checking these readings. 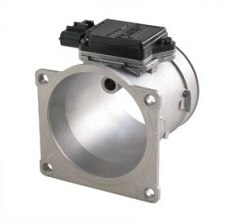 If the mass air flow reading is within specification while a concern comes and goes then it is not likely the problem. Be sure to check all air intake connections and gaskets, as well as the air filter before faulting the sensor, as these types of concerns can affect readings. On a final note; it is not always necessary to replace a mass air flow sensor that is reading out of specification, though most dealers will tell you differently! It is possible that the sensor is just contaminated from age or use of oil saturated, aftermarket air filters. You could try exposing the sensor hot wire (once the sensor is removed from the vehicle) and cleaning it with electronic parts cleaner and low pressure air. Use appropriate cautions. Once the sensor is clean, reassemble and install and check opeation, you may be pleasantly surprised! I hope this information has been helpful. Thanks for visiting , and have a great day!